I am writing at the end of a wonderful afternoon visiting University of Wales Trinity St David at Lampeter. The initial connection was with one of the members of Software Alliance Wales who attended my pre-walk lecture and is based in Lampeter. Software Alliance is a multi-million project to help support and promote ICT in Welsh industry. In the taxi to Lampeter I had to admit that I hadn’t the faintest idea of what was going to happen and what i was going to see. I knew I would be seeing part of the Roderick Bowen Archives, but hadn’t had sufficient time or connectivity to even find out what these were! However, I trusted that if the person behind the SoftwareAllianceTSD Twitter account thought it would be interesting, then I was happy to see why. In fact, whatever expectations I might have had if I had had any, would have been surpassed. We started off chatting over a late sandwich lunch. I had been forewarned to forego any Snickers to leave room. One of the activities of Software Alliance is to arrange projects for IT students in local industry and this grew into a broader discussion of the problems of initiating, and even more difficult, sustaining IT use. However, West Wales industry does recognise the importance of IT and they have had significant demand for social media skills in particular. Technology is often problematic at the edges, and indeed one of the academics there still had no broadband access at home. However, it is more important when you are far from the geographic centres of power, influence and market to be able to promote yourself virtually. 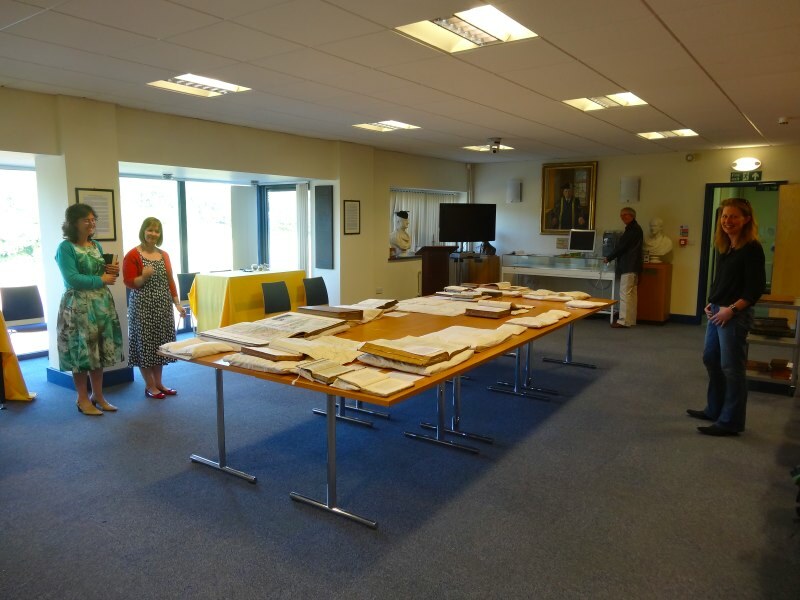 We then moved over to see some items that had been selected for my visit from the Roderic Bowen Archives, which is basically the University‘s archive of historical documents. I felt like royalty. A huge table was laid out with open books and manuscripts, one dating back to the 12th century; I’ve never touched a book so old before. But it had all been gathered and labelled thinking about the walk, some were focused on walking in Wales, some on maps and walking in general. 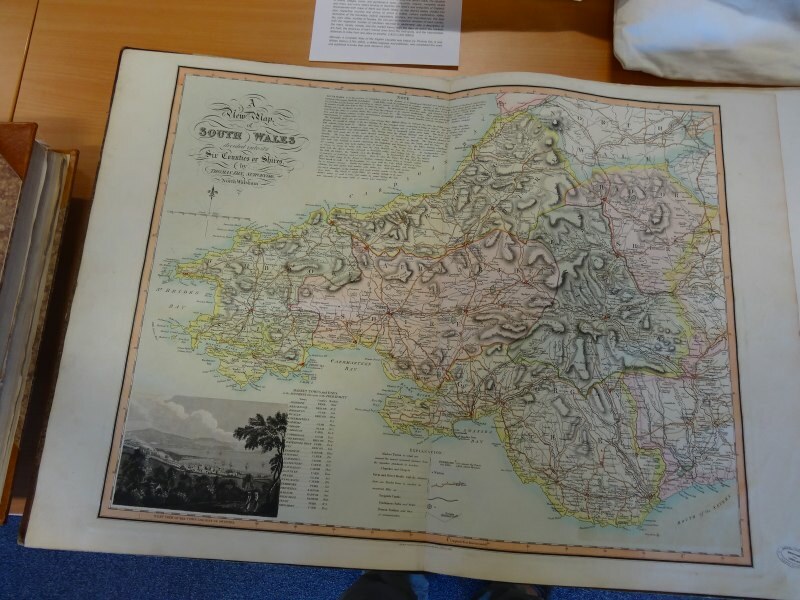 We went around the table anticlockwise, as I was travelling anticlockwise round Wales, going roughly from the older to the more recent sources. There were maps, including a copy of a John Speed atlas; I have referred to Speed’s atlas so often, but never seen, let alone touched, one before. There were diaries and accounts of travels in Wales including Gerald of Wales‘ travels and one writer who complained that the beds of Wales were uncomfortable. There was an interactive 19th century book for learning navigation including pull out sections and a spinning dial … and in case I needed it one reference to 17th century blister first aid. … On arriving at Lampeter I took a slight refreshment at the inn, and then went to see the college which stands a little way to the north of the town. … The grand curiosity is a manuscript Codex containing a Latin synopsis of Scripture which once belonged to the monks of Bangor Is Coed. It bears marks of blood with which it was sprinkled when the monks were massacred by the heathen Saxons, at the instigation of Austin the Pope’s missionary in Britain. It turns out that the manuscript is really 12th century and the wine marks probably spilt claret, but for me to touch the pages that George Barrow poured over was very special. I have been promised that they will be putting this all online as an online exhibition and cannot wait to see it. Finally, I saw a very early ‘geographic information system’ (from before the term existed) … and made in Hypercard. To demonstrate it an old 1990s Mac had been dusted off. It was for showing beach quality and other indicators, and used drilldown into areas, and the sort of thing that is now common in geographic visualisation, but was not so in the early 1990s. Lampeter is the oldest university institution in Wales, and was originally a theological college where my own uncle studied. It somehow manages to hold together its strengths in the most traditional areas of academia, such as theology and the classics, with strong vocational elements in technology and the arts. In an age of increasing cynicism and sheer exhaustion within higher education, it was truly wonderful to meet with such enthusiasm. Really looking forward to coming back sometime to Lampeter, if not before then for Mary Jones walk. Let me have details for 2105 conference when you have them. … and just a quarter left now!